In an earlier post, I discussed the care of sterling silver jewelry. Here, though, I wanted to expound on the virtues of a common modification of sterling silver--rhodium plating. For years, rhodium has been used to plate white gold items to make them even whiter--the plating does not change the gold content. 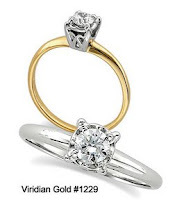 In fact, rhodium is many times more expensive than gold, and even more expensive than platinum, on a weight-basis! Since sterling silver is white, but tends to tarnish, the rhodium plating, which is also white, serves to block the oxygen in the air from attacking the silver (which is what causes tarnishing). One example of a rhodium-plated piece is our Sterling Silver Friendship Heart Necklace, #2064, which includes a sterling silver chain. But, not all sterling silver items will benefit from rhodium plating, because sometimes the patina that the tarnish lends to silver is highly desirable, especially when it is allowed to darken the recesses of a design in a piece of sterling silver jewelry. 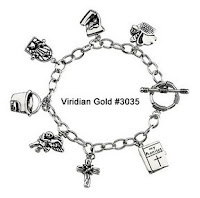 For instance, the Sterling Silver Spiritual Promises Bracelet, #3035, has a rhodium-plated bracelet, but the sterling silver charms have an antiqued finish, and they are not plated. So, it depends upon the design of the piece, and the preference of the designer, as to whether it will be rhodium plated or not. 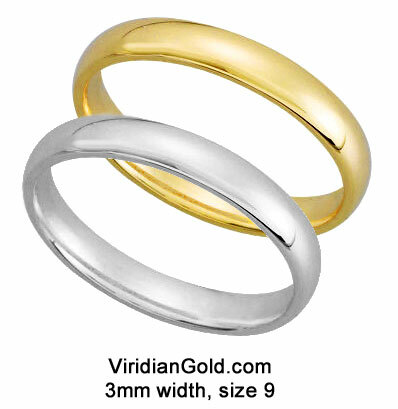 At Viridian Gold, we will always tell you if a piece is rhodium plated, and provide you with instructions for its care.